Often we dream about changing something in our lives. “I want to lose ten pounds,” “I want more friends,” “I want to improve my math grade.” The problem usually is that we are impatient. (I know I am!) We want what we want when we want it, and are not willing to wait and put in the hard work. 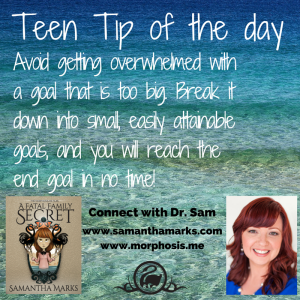 When we focus just on the end goal it can be overwhelming and frustrating. “It’s too hard!” is something that we frequently say, and we give up before we’ve eaten started. By breaking down a large goal into small, easily attainable (or achievable goals) when can feel a sense of satisfaction at each step along the way, and avoid thinking too far into the future. Staying in the present moment and the small task at hand keeps us focused, motivated, and moving towards the bigger goal. For example, if I want to lose ten pounds (which I do) I need to focus on small goals, such as cutting out soda, getting twenty minutes of exercise three times a week, and watching my portions. If I focus on losing just one pound a week, and making healthy choices, then I’m more likely to reach my goal. If you think “Ah…that will take over two months!” then remember: haven’t you already had this goal for at least two months? If you’d planned the goal differently the first time, you might already have achieved it!